Greetings. 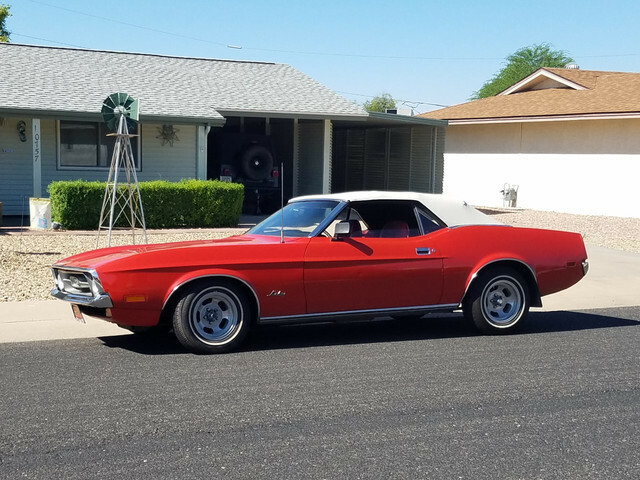 After owning a 1969 Mustang Grandé early in life and restoring my family's 1966 Mustang Coupe, I have been away from Mustang ownership for about 30 years. I am hoping to work out the purchase of a 1972 survivor convertible in the coming weeks. If all goes well, I will be spending some time here trying to learn some tips on how to spruce up this car. No major restoration is planned. I am hoping for a relatively low maintenance cruiser to enjoy in the Phoenix sun. Welcome from the Netherlands. Nice red convertible! Interesting mirrors on the car, haven't seen those before. Welcome from Amsterdam, the Netherlands. I hope it works out for you! Welcome from North Carolina. I think the mirror might be the standard one not the racing they were an option. I had not noticed the mirror, but now that you mention it, it does not look like some of the others I can see in pictures. I will have to see if this one was replaced and if it matches the other side. (10-04-2017, 03:11 PM)West Valley Mustang Wrote: I had not noticed the mirror, but now that you mention it, it does not look like some of the others I can see in pictures. I will have to see if this one was replaced and if it matches the other side. That mirror does not appear to be factory. I think the options were the color keyed racing mirror or a chrome one. Also the wheels are from a '73. The only year those wheels were offered.